Download the Latest Version of SVUnit from GitHubHere’s something to get Aldec users excited: SVUnit now supports Riviera-PRO. That means it’s no longer just Mentor Graphics, Cadence and Synopsys users that have the option of unit testing high quality Systemverilog RTL and testbench code, Aldec users can now join in the fun! For Riviera-PRO support, you’ll want v2.8 from GitHub. Fastest way to download it is to hit the big blue button to the right. From there, I’d follow the instructions in the README to start building your own short demo. That should take about 10min (if it takes longer than that, it’s probably my fault… not yours… so feel free to send me a nastygram with any troubles you’re having). Perusing the examples directory is a good second step. The designs in there should work just as they do with any of the other simulators. For further instructions, you can take a look at the SVUnit page or search for past blog posts tagged with SVUnit. 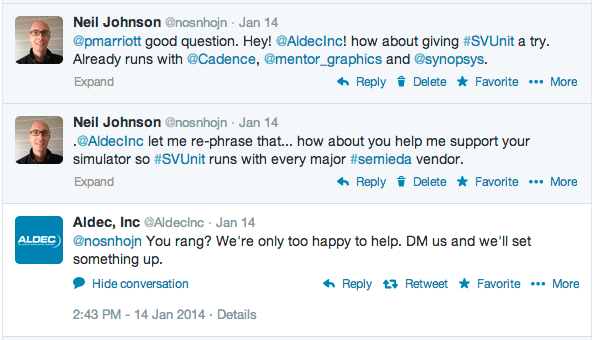 Lastly, I better make sure to thank a few people from Aldec that made this happen. It started on twitter where Christina Toole put me in touch with Sunil Sahoo. Sunil is an AE that did most of the work with the scripting support. Then there’s the mysterious people that go by the name of “R&D” who helped out a bit as well. All these guys cared enough to do the work… all I did was integrate it… so thanks all! PS: I unfortunately don’t have a Riviera-PRO license so I’m hoping that any Aldec users that run into trouble will help me out by sending any red flags to neil.johnson@agilesoc.com. Thank you kindly :). This entry was posted in Functional Verification and tagged aldec, svunit. Bookmark the permalink.